It’s our day!! Despite us being a supermommy NOT.. Hahah.. I would like to wish all BarelySupermommy’s readers a Happy Mother’s Day! A special shout out goes to my maa.. Pn Habibah Endan, maa I love you so much, not only today but everyday! I was oncall last night, and this morning, I came home to this..
Posted on May 13, 2012 May 16, 2012 by Dr Halina Mohd YunosPosted in MommyhoodTagged celebrations. Previous Previous post: Panic Mommy!! Next Next post: Real Swimming Lesson Here!! Happy Mother’s Day Dr. Halina : ) . next year boleh la dengar bella wish sendiri kat dr..
A BARAKAH MOTHER’S DAY TO MY MAMI & ALL INSPIRING MOTHERS out there! PS: Baby B looks so amazing with lil hijab. Aunty’s heart also sooooo sejukkkk see it. happy mother’s day Dr Halina..
bella is soooo adorable and cute !! 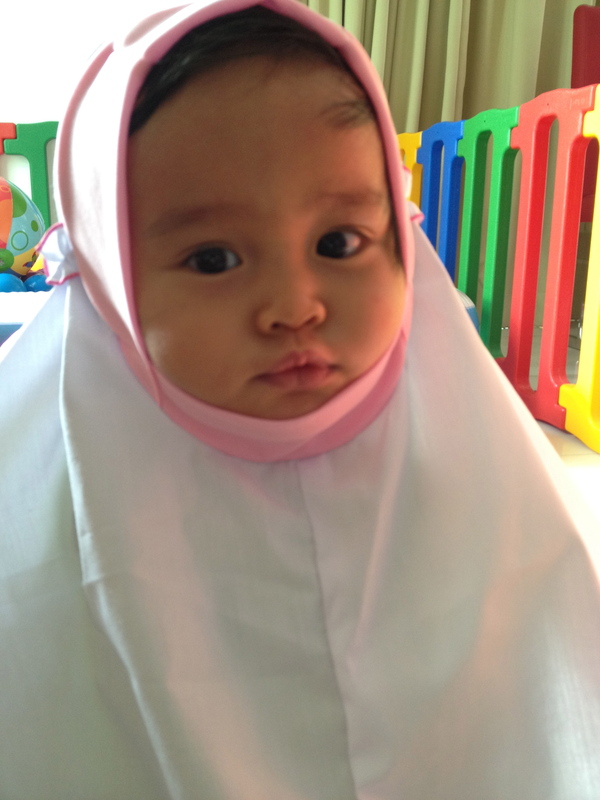 Soo cute lil ustazah B.
Baru la nampak gegirl Bella. heheh..
Bella solat subuh yeaaa tunggu mommy balik keje …. Ya Allah..bella so cute…dh mcm budak beso! watch this,it’s great how you can develop your child since baby..
hi dr, sume resepi for bella cam sgt best..dr download application dr iphone kan annabel karmel tu..tp ni ke dia punye title Top 100 Baby Purees: 100 quick and easy meals for a healthy and happy baby?koz sy nak beli hardcopy..just nak confirmkan..
Dia ada byk buku.. Saya d/load dr iphone jer.. Essential Guide To feeding you baby and toddler..
hai DrHalina..my son suspect hand, foot and mouth disease tp cuma naik kt kaki dgn kaki dlm mulut xada..sy bwk g klinik doc bg antibiotik..Dr ada any advise x utk sy how 2 handle this disease.